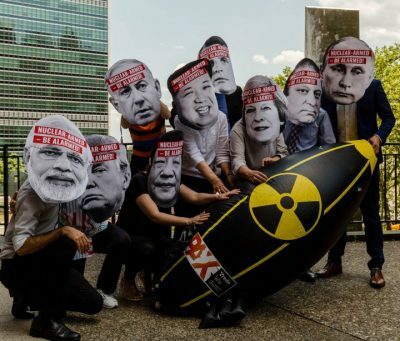 On Monday 26 June, the UN conference to negotiate a treaty banning nuclear weapons undertook the first read-through of a revised draft treaty text prepared by the conference president, Costa Rican ambassador Elayne Whyte. Now two weeks into this final round, many in the room expressed some frustration at this further exchange of positions and views. With the clock ticking towards the conference end and target date for adoption of an agreed treaty text on 7 July, many delegates expressed their desire to get stuck into negotiating treaty text, paragraph by paragraph, line by line. Between Wednesday 28 and Friday 30 June, the negotiating work of the conference proceeded in earnest, with 3 and occasionally 4 separate working groups considering different treaty elements. Though these sessions were closed to civil society, the sense of urgency and commitment was palpable, with delegates meeting late into the night. At 5 pm Friday, the conference reconvened in Conference Room 1 in open plenary session, to hear reports from the facilitators of each of the working groups on the progress made. One by one, the four facilitating diplomats described a highly positive atmosphere and the achievement of significant progress towards agreed proposed treaty language. When these texts became available a little while later in the evening, it was evident that substantial progress had indeed been made. I for one felt a considerable sense of relief to see the revised texts, particularly in relation to the most challenging and technically complex area of the treaty, the provisions on national declarations of nuclear weapons related activities, safeguards on nuclear materials, and the pathways by which states which possess or control nuclear weapons could accede to the treaty (articles 2 – 5 in the 27 June draft treaty text). This cluster had the greatest evident potential to bog down the negotiations. The revised provisions allow for both elimination of all nuclear weapons and nuclear weapons related facilities prior to a state joining the treaty (“destroy then join”); as well as states with nuclear weapons to join the treaty and then eliminate their nuclear weapons program, a “join and destroy” pathway. A number of gaps and loopholes in the previous versions of articles 2 to 5 of the President’s draft have been closed in this revised text, which also provides a greater level of consistency in the requirements of states joining the treaty, and greater internal consistency with the key prohibitions defined in article 1 of the treaty. The clarity, time-bound nature, verifiability and irreversibility embodied in these provisions have been strengthened. They have been crafted to anticipate future developments in safeguards and verification regimes, and do not allow any state to claim that there is no pathway for them to join this treaty. The group working on the essential core of the treaty, the prohibitions laid out in article 1, proposed the addition of “threaten to use” in addition to “use” of nuclear weapons as prohibited activities. With encouragement from ICAN, as well as support from the International Committee of the Red Cross, a number of states are advocating that a specific prohibition on engaging in military preparations to use nuclear weapons also be included in article 1. This would be consistent with the approach taken in the Chemical Weapons Convention, which has been signed by 192 states, including all of those participating in this negotiating conference, and therefore can be expected to have no issue with the inclusion of a similar provision in this treaty. Such language would add clarity that policies and practices of nuclear deterrence, including extended nuclear deterrence, are incompatible with this treaty. Nuclear deterrence is the main justification touted for continued possession of nuclear weapons, including by states which claim to rely on the nuclear weapons of others, such as the 28 states of NATO, South Korea, Japan, and Australia. While such policies and practices are clearly inconsistent with other provisions of article 1, including to “assist, encourage, or induce, in any way” prohibited activities, and the prohibition on use and threat of use, a clear statement that military preparations to use nuclear weapons are prohibited would strengthen the treaty. In relation to the victim assistance and environmental remediation, and international cooperation and assistance provisions, the new draft text includes a number of positive changes. The qualification “in a position to do so” has been removed from the obligation of states parties to address the needs and rights of those affected by the use or testing of nuclear weapons. A provision that such assistance should be required “without discrimination” has been added. An obligation on states to undertake appropriate environmental remediation of areas contaminated by the testing or use of nuclear weapons has been added. The provisions for international cooperation and assistance to facilitate the implementation of the treaty have been strengthened. A contested issue remains whether the treaty should in some way recognise the special responsibility of the states that have used or tested nuclear weapons towards victim assistance and environmental remediation. The provision for relevant non-governmental organisations to be invited to attend meetings of states parties and review conferences of the treaty has been retained. The number of state ratifications required for the treaty to enter into force has been increased from 40 to 50, a number that should still be readily achievable given the more than 120 states supporting the negotiating mandate for this conference and the more than 130 states participating in these negotiations. A welcome addition is a specification that the Treaty shall be open for signature at the United Nations in New York at a date to be specified in the next few months. The Arms Trade Treaty language on relations of this treaty with other agreements has been retained. Unlike the first draft, this proposed text appropriately does not subordinate this treaty to other international treaties and does not give priority to any particular other instrument. Although the provisions for the unlimited duration of the treaty and the treaty not being subject to reservations, but needing to be accepted in toto by states which join, have been retained, it is disappointing that the proposed draft allows for states to withdraw from the treaty if “extraordinary events” “jeopardise the supreme interests of its country,” language that is at odds with a categorical, humanitarian-based prohibition, and the object and purpose of the treaty as laid out in the treaty’s preamble. While the notice period for withdrawal has been increased from 3 to 12 months, it would be far stronger and consistent with the treaty’s purpose and substance to specify that states cannot withdraw from the treaty. This is the case for a number of other important international treaties, such as the UN Charter itself and the International Covenant on Civil and Political Rights. Regrettable, too, is the lack of a provision establishing a secretariat to assist with the treaty’s implementation and promotion. This could however be agreed at a subsequent meeting of states parties, and it is pleasing that the specification of the first meeting of States parties to be convened within one year of the entry into force of the treaty has been retained. Perhaps the most regrettable aspect of the preamble is its repetition of a big mistake in the NPT, a so-called “inalienable right of its States Parties to develop research, production and use of nuclear energy for peaceful purposes.” This repetition is unnecessary, and is legally potentially fraught repeated outside the context of the NPT’s safeguards provisions. Worse, its affirmation of the world’s most hazardous technology is wrong and counterproductive. Nuclear power spreads radioactive contamination at every stage; leads to creation of massive pre-positioned potential radiological weapons risking catastrophic accidents; is not needed; hinders transition to safe and sustainable energy solutions available now; generates a burden for future generations over geological time of large amounts of long-lived highly radioactive waste; and inextricably creates capacities to generate weapons-usable materials through uranium enrichment or extraction of plutonium from spent reactor fuel. It thus spreads the means for nuclear proliferation, increases the risk of nuclear war, and makes it harder and slower to achieve and sustain a world freed from nuclear weapons. This provision has no place in a treaty banning nuclear weapons, especially one based on humanitarian principles. While up until the moment of adoption of the treaty it is possible that changes could be made, practically it can be expected that the new draft formulations will by and large see the light of day in the final text, which is likely to be concluded in close to its entirety by 6 July. A new revised text from the conference pesident will be presented in an open plenary at 5 pm on Monday 3 July. Hopefully, that will continue the strengthening of the draft treaty which the negotiations to date have produced, with strong encouragement from ICRC and civil society. A treaty to comprehensively and categorically ban nuclear weapons is within our grasp, and should be in our hands in less than a week. The revised texts discussed above can also be accessed at Reaching Critical Will. Tilman Ruff is co-president of IPPNW and the founding co-chair of ICAN in Australia. He represents the federation on the ICAN International Steering Group.